Super Mario World: Super Mario Advance 2 brings back teh classic adventure of the side-scrolling Mario games. While planning the perfect vacation on Dinosaur Island, things go awry for Mario and Luigi when they learn that Princess Peach has been kidnapped again by the ever-diabolical Bowser. Being chivalrous plumbers, Mario and Luigi set out on a massive adventure to rescue their long-time friend. To reach their goal, they'll have to crush Bowser's evil Koopalings and solve some of the most challenging puzzles they've ever faced. Super Mario World for the Super Nintendo sits at or near the top of most "best video games" lists for a reason. At the time of its release, it was a dramatic evolution of the side-scrolling Mario series of action-adventure games, incorporating every gameplay element that worked in the older titles while adding a seemingly endless supply of new tricks. This new feature-complete version of Super Mario World for the Game Boy Advance proves just how timeless designer Shigeru Miyamoto's 1991 classic really is. In true Miyamoto fashion, the game starts with simple running and jumping and gradually gets more complex. Soon, you're swimming, flying, tossing fireballs, and riding one of several Yoshis--cute little dinosaurs--that appear throughout the game. The overall level design has yet to be exceeded in a 2-D platformer, with each colorful level packed with enough secrets to keep players busy for weeks. A lot of precision jumping is required, but the controls are so tight that directing Mario (or even Luigi, who wasn't playable in the original) becomes as natural as breathing within a few minutes of playing. Super Mario World: Super Mario Advance 2 boasts all 96 levels from the original Super NES game, from cheery Yoshi's Island through the sprawling Vanilla Dome to the grueling Star Road. While some levels emphasize pure action, others require you to puzzle your way out of the mazes and illusions. 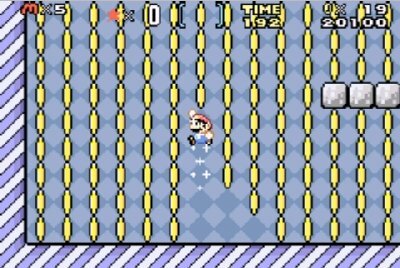 If you find the hidden key in Star World, you'll gain access to the extremely challenging Special World, which has its own hidden secrets. Mario and Luigi can jump up and down pipes, climb vines, swim, and toss Koopa shells. Yoshi the dinosaur can spit eggs, munch, and climb with his ever-helpful tongue. Cool touches include spinning platforms, forced-scrolling levels, and great attacks such as the spin jump. Mario and Yoshi fly with the aid of a unique feather, shoot fireballs when equipped with a special flower, and can even raise cute baby Yoshis. Each boss poses a unique challenge. Cross-eyed Lemmy Koopa likes to play hide-and-seek in pipes, while Iggy Koopa prefers to battle on a giant Koopa shell floating on a lava lake. This game will keep you busy on long trips! You Don't Want to Put it Down!! I had this game when I was in 6th grade (I'm in 10th now). It got stolen, but the point is that it was very fun, so much fun I didn't ever want to stop! I mean, I took it to school, and played it in class (never got caught...heh heh!). That's how, unfortunately, it got stolen. I like how this game was. In fact, it was a lot better than Super Mario 3, because of newer enemies, the introduction of Yoshi, new levels, and secret courses you can unlock!! If I had this game still today, heh, I wouldn't even be writing this review right now!! Super Mario World must be considered by many to be one of the best Mario games ever created, even one of the best games of all time. The side-scrolling action we are all familiar with is as good as ever, but this game has so much more to offer. All 96 levels are here from the Super-NES classic, almost exactly ported to the GBA. The graphics look great on this system and there may have been more secrets in the game in this version. Everything great about the game has been included: different exits to a lot of levels, keys to find secret levels and 5 dragon coins to find in each level. I guarantee a lot of gameplay and replay with this game because it will take a while to find everything in this game(unless you are using a strategy guide). I have had this game since it was released and I still havent quite found it all. There are 96 levels through 7 worlds with each world being ruled by one of Koopa's kids. Plenty of the Super Mario action that you remember. A very good transfer for a classic! I've already reviewed the original Super Mario World so I don't want to repeat myself in this review of the GBA version of the game. I'll keep this simple. This is a GREAT transfer of the original Super Mario World originally released on the SNES. All the graphics are brought back to life on the small screen and the control are practically EXACTLY the same as the SNES. I have seen some BAD ports of classic games, but this is one of the few that I can say could only be better if it were the original. This is a great game to have if you don't already on it on the SNES, or just want to play this game on the go. One of the best Videogames I've played in my life ! ! ! ! I rarely make any review about some video games, but this one is SO worth it. I think this is the best game ever made. The best Mario in history, I already finished the game 96% but I still can't get enough of it. The best video game in history. In my opinion any DONKEY KONG COUNTRY game, specialy DONKEY KONG COUNTRY 2, and any MARIO game, specialy this MARIO, are the best games in the entire history. I also love ZELDA series and I think the CLASSIC NES SERIES is the best of them all! I bought all three of the games listed above (SUPER MARIO WORLD, this one, DONKEY KONG COUNTRY 2, and LEDGEND OF ZELDA: CLASSIC NES SERIES) and I personaly think that was the best buy I did on any nintendo games EVER !!! The 2nd best game ever! Super Mario world is the best gameboy game I have ever played! Jump, Yell, and get angry! This game (from a kids review) is what is called "Old School", and it is. This game was made way back when with SNES, and now is put on the gameboy advanced SP. I thought in the start it was the best old mario game. NOw i';ve really gotten into it, and now i'm stuck! I can't go any further. This game was fun. I jumped when i finished a world, i yelled in joy, and now I'm angry. maybe i'll find a way to get out. I really recomend this game even though you might get stuck like me! THE MOST DREAD MARIO GAME! I really cant tell you if this is just great or bad. Mario games are fun but to tell you the truth just,getting to old for this. 1-Great gameplay and great for shutting up ya kids.if ya have any. 2-Lots of levels so it will be long and entertaining. 3-Tatics needed a little a bit. Need to grow ur mind dude. 1.Dont ya ever get tired of jumping on things. 2.Ya might play to much.Try to look at ur self in the mirror if you have the second. 3.Portalble games are bad To small and kinda gets you dizzy. 4.PLAY AS A FRENCH,ITALIAN MULTICULTURAL IDIOT or idiots.Luigi. Super Mario World has always been one of my favorite Mario titles. It is actually my favorite 2D Mario game. Having not played it since getting rid of my Super Nintendo many moons ago, I was really excited to pick up this GBA version. The game is just as good as I remember. Colorful and vibrant 2D sprites, mode-7 effects, fantastic music, and super tight controls. The game is full of secrets to find as well, since most levels have the regular "exit" as well as a hidden one. I am playing the game on a DS Lite and I do have a small issue with the controls. Since this is actually a GBA game and that device only had two face buttons, the "X" button from the SNES game is mapped to the "R" trigger instead. The DS Lite does have "X" and "Y" buttons like the SNES pad, but there is obviously no "customize controls" option in the game, so you have to stick with the default setting of using the R trigger. Also, given the orientation of the buttons on the DS Lite, it would be far more comfortable to have "run/action" as the "Y" button and jump as the "B" button (like in New Super Mario Bros.). But again, you can't change it. So you are stuck with "run/action" on B and jump on A, which can be a bit uncomfortable. 96 exits to find makes a great game! This game is gigantic!You'll find yourself playing for hours on end, trying to find secret exits and colored yoshis. A great thing abot this game is that it gets harder and harder! Mario Bros is a great finishing touch. There's pretty much a debate on the best Super Mario game: Super Mario 3, Super Mario World or Yoshi's Island(but you control Yoshi instead). Some might say Mario 64 but the lack of gameplay moves doesn't hold a candle to the many gameplay mechanics each one of the 3 provide. So we delve into one of them: Super Mario World. Story: What little story there is. As usual, Princess Peach gets kidnapped(I swear that b**** needs bodyguards or take up karate or something). So it's up to Mario to save the day as he traverses worlds in caves, the chocolate level, underwater and in the air. Graphics: This is Super Nintendo graphics so granted these aren't stunning anymore. But it does have a nice vibrancy to it and the variety of the levels adds some nice changes to the scenery without being too repetitive. Sound/Music: I often call Nintendo good support music. Besides the Mario theme, nothing is really hummable yet it doesn't feel out of place. They added some voices for Mario and Luigi which as usual get annoying. Gameplay: I remember playing this on the SNES and I was so happy I cleared all 96 stages, got the Star Road finished, the secret areas and everything. Now I have to do it again, ugh. All the levels are here with some minor tweaks. It was this one I believe they introduced one of Mario's famous sidekicks: Yoshi, the green dinosaur who likes to eat anything and s**t it out and makes eggs that he can fling at people(only in Yoshi's Island and maybe some others). He also turned into a different colored Yoshi depending on what he ate. So red turtles gave him abilities to shoot fireballs while one enabled him to fly and another gave a slight earthquake quality when he bounced. Mario 3 wins in turns of transforming Mario. In 3, he had the tanooki suit(that raccoon), the frog suit, that shoe, not to mention the fire flower and the leaf, capable of making him fly. With this one he gets the fire flower and the feather, giving him a yellow Superman cape where he can fly. It's different than the leaf cause that just made him soar straight up while here you can fly across. He can glide down by just holding the button while in 3 you had to repeatedly hit it. My all time favorite Mario game. This game is the greatest Mario game I have ever played. All the Mario's seem to have gone down hill to me since this 4th installment. But now that this classic SNES game has been revived and upgraded to the GBA, its back, and even better then ever!